After more than a year of writing about Belgian beer, I finally managed to get my sorry self over to the Delirium Café yesterday. Pretty poor performance on the part of your Brussels-based correspondent here, given that this old town bar holds the world’s record for having the largest number of beers on sale, including about seven million Belgian ones. OK, a few hundred Belgian ones, but who’s really counting when there are so many on offer? Actually, the Guinness Book people did just that a few years back and found over 2000 types at Delirium. I went there with Michael, a friend who was in town for a conference we were both attending. He’d just come in from Germany and brought me three bottles of German beer to test -- more on those later, however, because this evening, we were tasting Chimay Grande Réserve 2005. As you’ll see from the photo, the bottle had quite a different label from the other Chimay GRs I’ve tried -- most notably, not blue. I think the bottle was produced for some kind of exhibition, because a small “LOT: EXPO2005” was painted on the bottle, and the label itself was painted, where usually they are simply paper labels stuck on. Anyway, it made a very convincing pop when the barman opened it for us. The initial taste was black cherry, smoky oak, and full cream. It seemed to me not as rich as Chimay Grande Réserve 2001, and it surely had none of those “slurry” notes of the Chimay Grande Réserve 1999. Still, you could tell age had done some work here, as there was much more going on than the Chimay Grande Réserve 2007. Few surprises, then -- older beer, more complex taste -- but well worth drinking all the same. 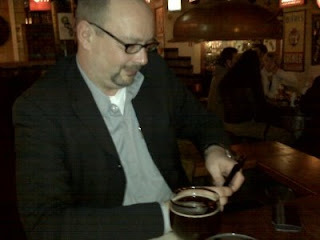 Initially, I wasn’t sure if I would manage to convince Michael, slightly wary of variations from the Reinheitsgebot, of the beauty and variety of Belgian beer. But the Chimay Grande Réserve 2005 did seem to move him in the right direction. The guest Michael of course enjoyed the 2005 Grande Reserve as well. As a German only used to drink "Reinheitsgebot" beer, I was more than surprised to taste so many different "notes" in a beer. The fruity beginning on the tongue, and when it goes down the mixture of sweetness combined with a slightly bitter tone: marvellous. I really found out that the Belgians are not only capable of frying everything, they can brew. 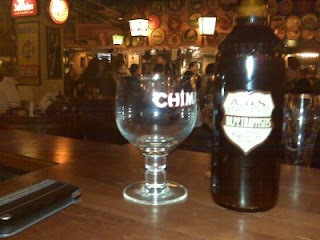 We Germans are sometimes ignorant with regard to beer-brewing, but the Chimay is really brilliant. I have to admit that I am not one of those typical Germans, cause my favourite is an Irish Stout from a small brewery in Dublin, so I don't focus on German beers only. I am looking forward to read Andrew's comments on the German ones I gave him. Maybe he will start a new blog with his favourite German ones. A new blog on German beers? But I still have several hundred Belgian ones to get through! You are off to a good start with taking a wider European perspetcive on this, Herr Stroehlein. August in Franken should help to get the German beer blog really moving forward. I have got lots of German beers under my belt, though it may be more like over the belt and I will bring some of them along to Franken. I will, of course, happily help you out with consuming, tasting, assessing... and let you be the scribe.